There are several ways to edit a reference. You can click the Edit icon from the main view area, globally edit the author, descriptor or periodical from the Lookup index, delete references, globally add. move, delete or replace information in a particular field and edit the folders in which the reference is contained. From the view window for a particular reference, click the Edit link located at the bottom right of the window. The Edit Reference window appears. Select a potential bibliography output style to View Fields Used By Your Selected Output Style. Click on any field name to view style specific notes at the bottom of the page. Fields displayed first are recommended fields -- your reference entry may not have information for all fields -- and the recommended fields are not required in order to save the record. To add the reference to a folder, use the Add to Folder button found above the reference. To remove a reference from a folder, click Remove from Folder button next to the folder name in the In Folder(s) field. Click Save Reference to save the changes. Add: This option will add the same information to a particular field in a group of references in one action. This is particularly useful when importing data from online databases which require specific information in your output style. For example, you can easily add the name of the Data Service Provider to the Data Source field and the specific database to the Database field. Move: This option allows you to take the entire contents of a field and move it to another field for each reference selected. The Reference Type and Source Type fields cannot be edited in the move area. Delete: This option allows you to delete the information in a specific field of the selected references. The Reference Type and Source Type fields cannot be deleted. Replace: Searches for a specific term in a single field (or all fields) and allows you to and replace the term with different information. The Reference Type and Source Type fields cannot be edited with the replace option. 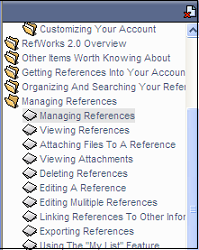 Select the references you want to edit - marking specific references or by selecting the Page or the All in List options. Click on the Add / Move / Replace or Delete tab. Select the field you want to edit from the drop down list or choose the Electronic Source Related Fields option if you want to include information in the database, data source, links and retrieved date field all at once. Type in the data you want to add or replace, or select the field you want to move or delete. Overwrite Existing Data. Any data in the field you are editing will be replaced with the data you are adding. Leave Existing Data Alone. If the field contains data the global edit feature will skip that particular reference. Click the Add / Move / Replace / or Delete button. Search the Refworks 2.0 help screens for info on editing references.